The slopes facing the sunset are the best ones in Valpolicella Classica for producing high-quality Amarone. Here, where the day is longer, the vines that face Lake Garda benefit from the reflection of its light and from its mild climate. Amarone is a unique wine due to its origin, ancient grape varieties and production method (vinification of grapes that have been semi-dried for 3-4 months on bamboo racks). Deep ruby red colour with violet tinges to the edges. Clean, very powerful and complex on the nose with good alcoholic backbone amid the sweet aromas of dried prunes and raisins. Soft and dry on the palate with typical baked cherry flavours mixed with hints of cocoa and cinnamon. Attractively long finishing and full-bodied with soft tannins. The Costasera Amarone expresses a particular majesty and complexity. Amarone is a full-bodied wine for grilled or roasted meats, game and strong tasty cheeses, such as parmesan. Generally considered a wine for meditation, it is a great after-dinner wine. Masi production strategy aims to emphasize the personality of each single product, while maintaining a recognisable Venetian style. In 1958, Masi was in the forefront of the work to identify the historic "cru" vineyard sites for Amarone. In 1964, Campofiorin was the first in a new category of wines, reinventing the technique of double fermentation and continually updating it. 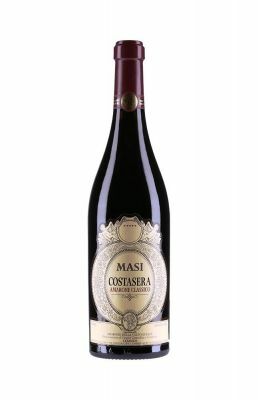 Masi has also updated the style of Amarone, using new appassimento and vinification technologies. Masi wines are modern, attractive, well-balanced and easily identifiable; characteristics which have earned Masi recognition for having "revolutionized the art of wine-making in the Venetian region". Hugh Johnson defines Masi as "a touchstone for Veronese wines".